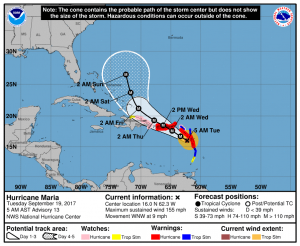 Maria had maximum sustained winds of 160 mph (260 kph) late Monday when it slammed into Dominica before dipping for a time to a Category 4 major storm. The U.S. National Hurricane Center said Maria’s top sustained winds then returned to 160 mph (260 kph) strength shortly before daybreak Tuesday with the eye of Maria located about 65 miles (100 kilometers) west-southwest of Guadeloupe. The storm was moving west-northwest over the Caribbean at 9 mph (15 kph). The storm’s hurricane-force winds extended out about 35 miles (45 kilometers) and tropical storm-force winds out as far as 125 miles (205 kilometers). Forecasters said storm surge could raise water levels by 6 to 9 feet (1.8 to 2.7 meters) near the storm’s center. The storm was predicted to bring 10 to 15 inches (25 to 38 centimeters) of rain across the islands, with more in isolated areas. The current forecast track would carry it about 22 miles (35 kilometers) south of St. Croix in the U.S. Virgin Islands late Tuesday and early Wednesday, territorial Gov. Kenneth Mapp said. There are still problems in the Caribbean from Hurricane Irma, and now Hurricane Maria. Hurricane Irma was the strongest hurricane ever in the Atlantic. Hurricane Irma wiped out most of the island of Barbuda, caused a million to lose power in Puerto Rico, devastated St. Martin’s, hit Cuba, and hit Florida and caused millions to lose power. Another hurricane, Hurricane Harvey, dropped the greatest amount of rainfall in any USA storm. My prayers continue to go out to those affected by these storms. Presumably, the disciples learned something from that experience. Wet weather is sometimes used by God for judgment and correction. Hurricanes are consistent with prophecy (watch also the recent video Hurricanes and Prophecy). Since that was published, we have had record smashing heat, stronger hurricanes, and odd weather problems. These weather issues should serve as a wake-up call. Earthquakes, floods, typhoons, and hurricanes are troubling. We are in the beginning of sorrows. UPDATE: 1400 PDT: Mexico got hit with another earthquake! Weather events should serve as a wake-up call to all. What will later happen to islands after a prophesied earthquake to come will be much worse (see Islands and Bible Prophecy). As far as hurricanes go, here is a link to our video: Hurricanes and Prophecy. This entry was posted on Tuesday, September 19th, 2017 at 6:30 am	and is filed under Prophecy. ‘Severe storm leaves about 700K without power in Northeast;’ Puerto Rico, Dominica, St. Martins, and Virgin Islands still suffering; Will you consider the St. Lucia Prime Minister’s warning?